Have you ever been late for something? Say a date? Maybe an airport pickup ride? How about a blog? Yes, today’s post was a little later than usual, but it was all to serve a point (the point that I need to spend a little less time doing graduate school work—and yes, Mom, that I should write my posts farther in advance). 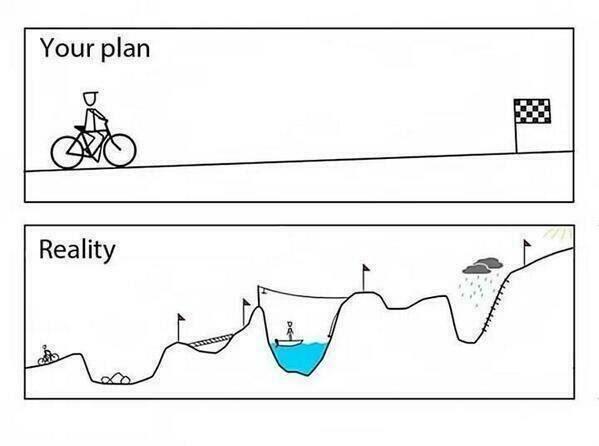 Really, though, my tardiness does help illustrate a prominent finding within social psychology: The planning fallacy. Essentially, the theory claims (and has shown) that people chronically underestimate the amount of time they think it will take them to complete a task. Couldn’t have explained the planning fallacy better myself…well, excluding the whole post I wrote to the left. For example, if you are planning the “Recruitment Weekend” for all of the new students accepted to your graduate program to come visit the school this weekend (this is a loose, hypothetical situation here), you may underestimate the amount of time it takes to figure out the schedules for everybody in the program, meaning you’re writing your blog at midnight instead of early in the morning. More commonly, though, let’s say you’re getting ready in the morning. Thinking you have enough time to sleep in and still catch the bus, there’s a good chance you’ll forget a bunch of small things (e.g. brushing your teeth, finding matching socks, etc.) that will subsequently add up to extend your estimation. In fact, one study estimates that people underestimate the amount of time it will take them to complete a task by around 40%! And these underestimations have been shown for things as little as mailing a letter to as large as filing your taxes. Now, one of the reasons we underestimate the time it will take us to do something is because we picture the event in one large, abstract picture. A way to help subvert the planning fallacy, then, is to break down each individual step and calculate the time piecemeal. For example, for my date Wednesday night, instead of thinking I’d be able to just cleanup and then head over, I should have calculated how long it would take me to, 1) shave my neck beard 2) pluck my one gnarly eyebrow hair, 3) choose an outfit that says both casual, professional, and stunningly good looking all at once, and 4) every other minor detail. When we break down our tasks like this, it helps us get a more accurate sense of how long it should take us. Interestingly, another way to help dispel our errant inclination to underestimate time, is to imagine yourself doing the task in the 3rd person. That is, instead of imagining myself preparing for the date through my own eyes, if I had imagined myself doing all those things through a third party’s perspective, it would have forced me (once again) to focus on all the individual steps. Of course, even with all my insight into this phenomenon, this blog still turned up late. So the moral of the story is really: Jake should practice what he preaches! Buehler, R., Griffin, D., Lam, K. C., & Deslauriers, J. (2012). Perspectives on prediction: Does third-person imagery improve task completion estimates?. Organizational Behavior and Human Decision Processes, 117(1), 138-149. Kruger, J., & Evans, M. (2004). If you don’t want to be late, enumerate: Unpacking reduces the planning fallacy. Journal of Experimental Social Psychology, 40(5), 586-598. Well how did the date go?? I hope it went well 🙂 I admit I was surprised at how late you sent it out, but you have been so consistent with this blog I gotta say I respect it. Blogging is tough. Writing is tough. Hopefully we can chat this weekend about, well, writing! Haha The date went well! (even after I straight face-planted on the ice when stepping out of the car). And I would love to chat this weekend–but I will be/am slammed with this “Recruitment Weekend” planning that I’ve been doing. Maybe sometime during the week or next weekend we can connect!